The following information has been drawn from the Society’s extensive administrative files, publications and reports submitted to various bodies in the furtherance of the Society’s objectives. Information on many of the issues and events covered has been sourced in the pages of the Society’s Journal, an index to which, covering the period 1992-2012, is available on the top menu of this Page. Likewise, many issues were also covered in the monthly newsletter ‘Ireland’s Genealogical Gazette’ which is also indexed from 2006 to 2011 and available on the top of this Page. The Society was founded as the Dún Laoghaire Genealogical Society on the 25th October 1990 by a group of neighbours in Dún Laoghaire, Co. Dublin. The Society grew quickly and just ten years into its existence, the members decided to change the name of the organisation from the Dún Laoghaire Genealogical Society to the Genealogical Society of Ireland. This new name more adequately reflected the activities, scope and membership of the organisation and indeed, it could be argued that the Society outgrew its ‘local identity’ within two to three years of its foundation in 1990. What distinguished the Society from similar organisations in Ireland at the time were its progressive and innovative objectives and its determination to campaign on behalf of its members. The Society joined the [international] Federation of Family History Societies in 1991 to forge links with the international genealogical community. In Ireland the Society sought similar cooperation and indeed, in the summer 1992 edition of its Quarterly Journal, the Society proposed the establishment of an ‘All Ireland Federation of Family History Societies’. Whilst, the federation proposal was rejected by others, matters on the political front later brought the various genealogical organisations on the island of Ireland together—albeit in an ad-hoc grouping. 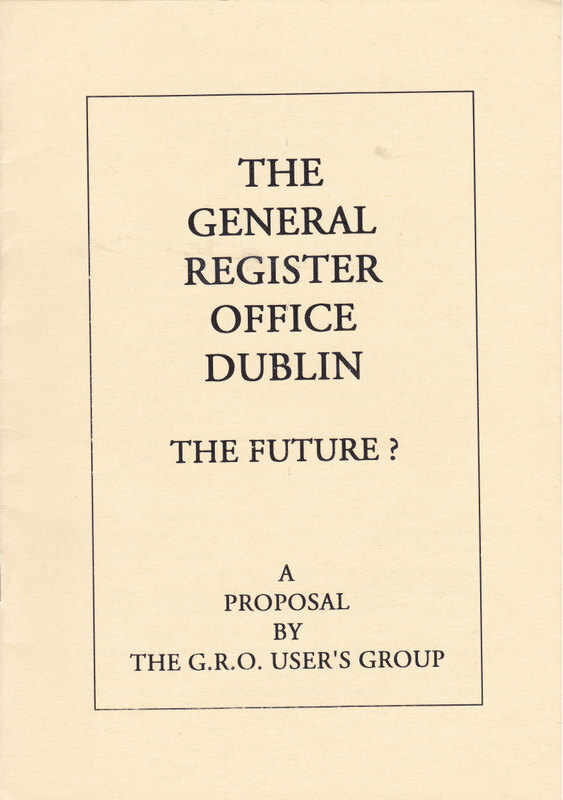 The Irish government’s plans to relocate the General Register Office in Roscommon Town gave rise to the GRO Users’ Group in late 1992 to campaign for the retention of a Public Search Room in Dublin. 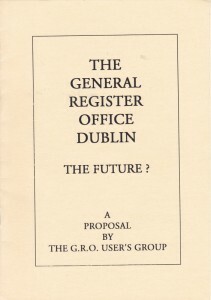 The Society published the GRO Users’ Group proposals in a pamphlet in April 1993 and proactively supported the campaign. Also in 1993 the Society alone successfully campaigned to have the closure period for census returns reduced from 100 years to 70 years in the Statistics Bill, however, despite assurances from the Minister [Noel Dempsey, TD] in the Seanad, this was not included in the final text of the Bill when it later passed all stages in Dáil Éireann and therefore, the Statistics Act, 1993 became law on July 14th 1993 with the 100 year rule intact. 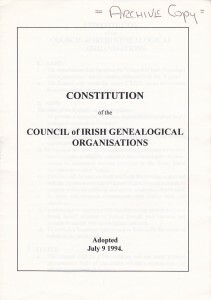 The reference to the above on page 4 of the ‘Briefing Document’ circulated in February 2011 by the Council of Irish Genealogical Organisations (CIGO) to politicians is completely without foundation as the 1993 Act was signed into law in July 1993 and CIGO was not established until July 1994. In late 1993 and again in early 1994, the Minister promised to retain a GRO ‘research facility’ in Dublin. This apparent success by the GRO Users’ Group encouraged some of its members to seek to establish a more permanent structure for joint action on matters of mutual concern to Irish genealogical organisations. 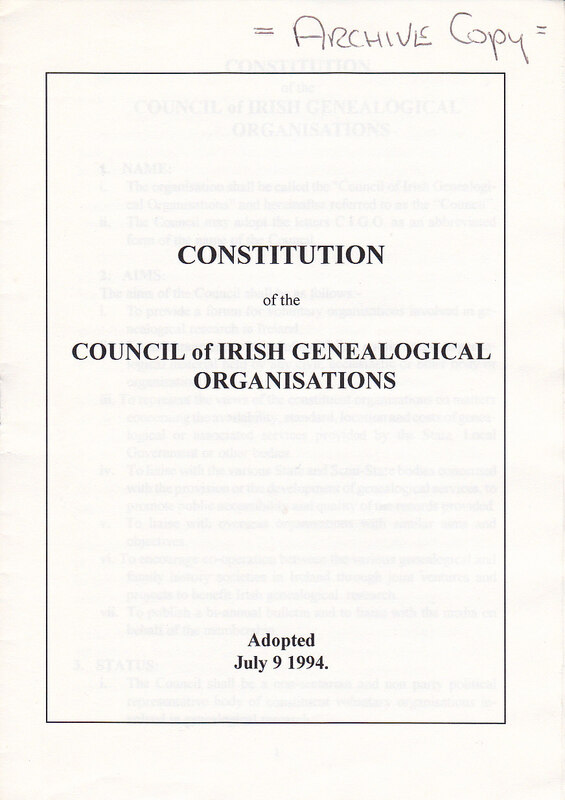 The Society drafted a constitution for a new umbrella organisation for Irish genealogy and at a meeting held in Dún Laoghaire on July 9th 1994, the Council of Irish Genealogical Organisations (CIGO) was established. The full text of the Heritage Act, 1995, is available here. During this period the Society’s publications and group projects grew, as did its Archive. The Open Meetings were increased to two per month in 1993—morning and evening – at which, members discussed the various genealogical services provided by the State and State Agencies. With the constant support and encouragement of our members, the governing body of the Society made strenuous efforts to promote a better understanding of the needs of genealogists in Ireland. In 1996 the next legislative challenge—National Cultural Institutions Bill—was a stunningly successful collaboration with Senator Paschal Mooney where this Society achieved twenty-eight amendments to the Bill dealing with the services provided by the National Library, including heraldry. A further three were secured during its passage through Dáil Éireann. The strategy adopted by the Society and fully supported by Senator Mooney involved taking a holistic approach to this important piece of legislation and therefore, our amendments covered areas throughout the Bill. This constructive approach was greatly appreciated by the then Minister for Arts, Heritage and the Gaeltacht and now President of Ireland, Mr. Michael D. Higgins, who personally wrote to the Society after the enactment of this legislation in 1997 commending the Society’s very significant contribution to the Bill. It is important to remember that the National Cultural Institutions Act, 1997, covered much more than the State’s delivery of heraldic services, upon which, the other genealogical organisations focused their attention. During the debate in Seanad Éireann certain press reports appeared that were highly critical of the Minister [Michael D. Higgins] with unfounded claims on his commitment to Ireland’s heritage, including heraldry. This sort of campaigning was not supported by this Society and, indeed it was roundly condemned by all sides in Seanad Éireann. 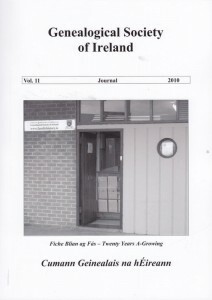 Whilst, this brief history of the Society cannot hope to cover all aspects of the development of the Society over the past twenty two years, it is hoped that it creates an appreciation and awareness amongst our current membership of the Society’s important contribution to the promotion of Irish genealogy and heraldry. The full text of the National Cultural Institutions Act, 1997, is available here. The Society rapidly became undoubtedly the most active genealogical organisation in Ireland having celebrated hosting its 100th Open Meeting on April 9th 1996 with guest speaker Tony McCarthy, Editor and founder of ’Irish Roots Magazine’. In the same year, ‘Irish Roots Magazine’ published a series of articles by various authors from home and overseas on the current state and future of Irish genealogy. These articles make for very interesting reading nowadays given the developments in Irish genealogy over the past sixteen years. This edition of ‘Irish Roots Magazine’ is available here. The information provided by the authors of each of these following articles should help to clarify matters in respect of the date of the establishment of the various genealogical organisations and, of course, their involvement or otherwise in national campaigns. Interestingly, when these articles were published between three and four years after the enactment of the Statistics Act, 1993, [July 1993] the campaign for the release of 1926 census is not mentioned. ‘The Future of Genealogy in Ireland’ by Perry C. McIntyre (No. 2. 1997, p22-23). 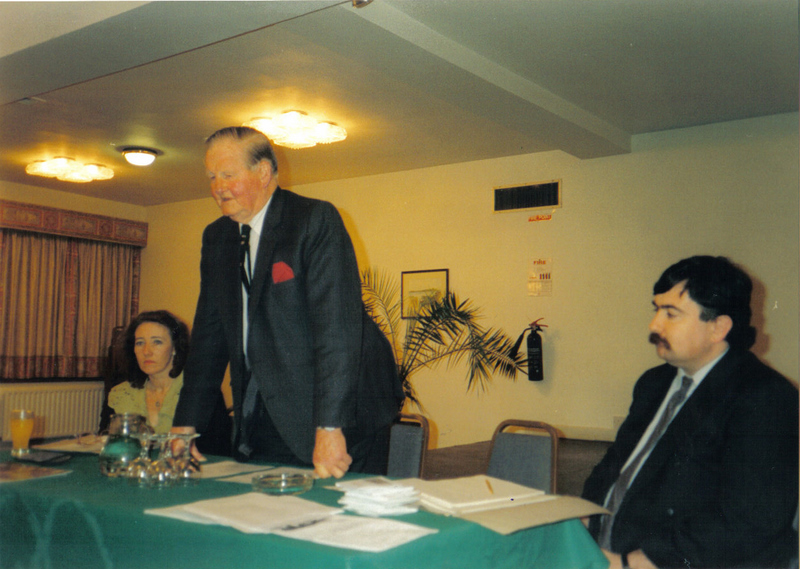 In May 1996 the Society organised a Members’ Internet Group and three years later, in September 1999, it hosted Ireland’s first genealogical conference dealing exclusively with computerisation and the development of the Internet. To assist and encourage Members wishing to write a family history, Bill Hogg established a ‘Writers’ Group’ in July 1996 and from this worthy initiative many successful authors emerged. 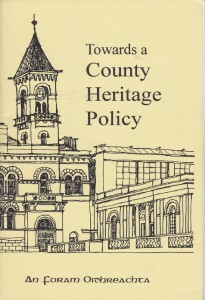 Earlier in February 1996 the Society’s proposal for the establishment of a County Heritage Forum came to fruition involving each of the heritage and arts organisations in Dún Laoghaire Rathdown. In December 1996 the long-awaited Value for Money Report on the Irish Heritage Centres was published by the Comptroller & Auditor General’s office and its findings, whilst largely vindicating this Society’s position on the operation of the Heritage Centres, the report shocked the Irish genealogical community. The full report can be accessed here. In January 1997 the ‘Genie Gazette’ was born and remained the title of the Society’s newsletter until December 2005. 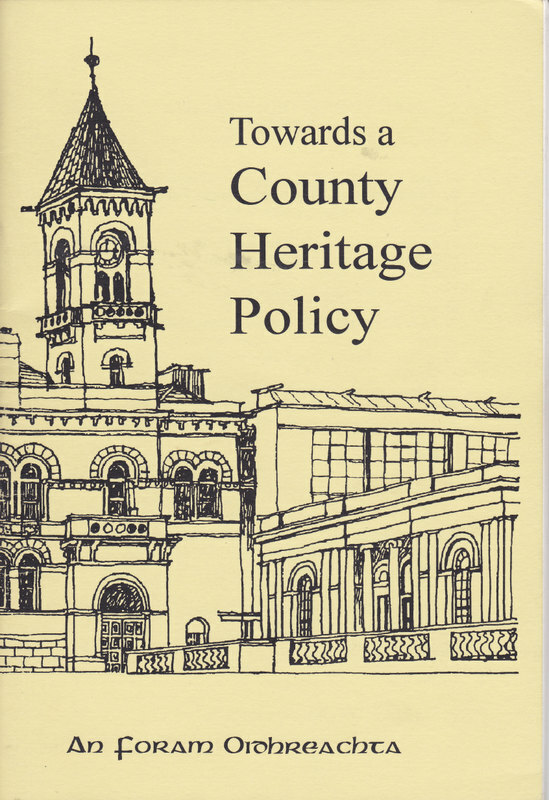 In 1997 the Society published the report of the Dún Laoghaire Rathdown Heritage Forum ‘Towards a County Heritage Policy’ to wide acclaim. The concept of a ‘County Heritage Policy’ and of appointing ‘County Heritage Officers’ was later adopted by the Minister and rolled out across the country over the next ten years. In March of 19 97 the Society’s long-running campaign for a permanent home for its growing archive received a considerable boost with the allocation by Dún Laoghaire Rathdown County Council of the Martello Tower at Seapoint to the Society. Fund raising to restore the Tower started in earnest and would continue for the next six years before restoration work could begin on the Tower dating from 1804. At the 1997 AGM the members adopted the ’Principle of Public Ownership & Right of Access’ to our genealogical and heraldic heritage. Though this fundamental principle is now the ‘cornerstone’ of progressive public access policies of most archives and libraries in Ireland, it wasn’t immediately supported by others in the genealogical community at the time. Members at the 1997 AGM made acceptance of this principle a condition of the Society’s affiliation with any other heritage organisation. Indeed, it was the failure of the Council of Irish Genealogical Organisations (CIGO) to endorse the principle which precluded the Society from continuing its membership of CIGO in 1998. This ‘Principle’ is now recognised as the cornerstone of best practice by professionals in the field and by progressive repositories throughout Ireland. In October 1997 the Heritage Council finally launched its study of Irish genealogy which had been advocated by this Society and secured during the debate on the 1997 Act. Whilst, the interim report was promising and contained many of this Society’s proposals, press reports soon disclosed that the Heritage Council had opted to propose a purpose built ‘pay-for-view’ genealogical centre where resources that had been ‘free-to-view’ in other repositories would be centralised and commercialised. This Society was totally opposed to these plans and when the final document was published in 2000, it was abundantly clear that it was seriously at variance with the objectives for the study laid down by the Minister. The Society urged the Minister to reject this proposal and, in answer to a parliamentary question, the Minister very publicly dismissed the report in Dáil Éireann. The Heritage Council’s failure to adhere to its remit was a huge opportunity lost for Irish genealogy and undoubtedly it retarded its development over the past decade. The Society’s submission to this wide-ranging study was published in the Summer 1999 issue of the Journal of the Dún Laoghaire Genealogical Society pp78-88. The Society also made a wide-ranging submission on many aspects of our heritage, including genealogy and heraldry, to the public consultation process on the National Heritage Plan launched by Minister Síle de Valera, TD, on September 10th 1998. In September 1999, the Society hosted Ireland’s first conference on ‘genealogy and the Internet’ – long before most Members even had access to computers. Above we chronicled the period leading up almost to the dawn of the new millennium. Now we will concentrate on the important milestones of its development since then. It was clear to all that the name ‘Dún Laoghaire Genealogical Society’ had long been a misnomer when one considered the activities and public profile of the Society. Therefore, in 1999 the Members decided to change the name of the organisation to more accurately reflect its standing in Ireland and the name ‘Genealogical Society of Ireland’ was adopted. In January 2000 the Society published an innovative proposal for the provision of public access to the ‘historic’ records of the General Register Office. This ‘Regional and North/South Proposal on the Records of the General Register Office, Dublin’ (see Vol. 1 No. 1 of the Journal of the Genealogical Society of Ireland pp51-56) sought to provide access to these records in repositories around the country. Unfortunately, this imaginative and very workable proposal was opposed by those supporting the ‘pay-for-view’ facility advocated by the Heritage Council. In the Spring 2000 issue of the Journal of the Genealogical Society of Ireland (Vol. 1 No. 1), the Society published the first comprehensive examination of the application of One-Name Studies in the Irish context. This article was later featured in two issues of the magazine of the Guild of One-Name Studies in the UK. The Society’s first President, Denis, O’Conor Don (elected 1991) died in July 2000 and the position was to remain vacant for five years. The Society had an Irish oak tree planted on Killiney Hill in his honour overlooking the late President’s beloved Dún Laoghaire. His name has been inscribed on the nearby memorial. The Society’s name chang e was quickly followed by incorporation of the Society in 2000 and an application for a Grant of Arms from the Chief Herald of Ireland. 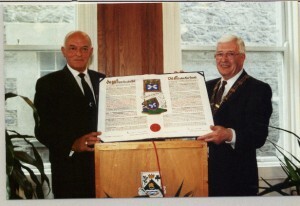 The Arms were presented to the Society at a Civic Reception in the County Hall, Dún Laoghaire in 2001 by the Chief Herald, Brendan O’Donoghue. Thus, the Society becam e the first genealogical organisation to receive a Grant of Arms from the Chief Herald of Ireland only to be followed five years later in 2006 by the Association of Professional Genealogists in Ireland (APGI). 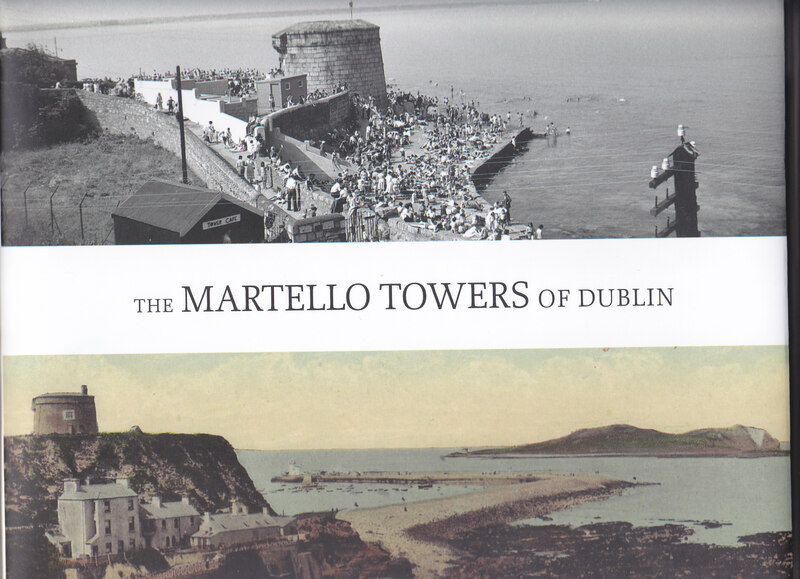 In 2002 planning the restoration of the Martello Tower intensified with professionals offering their services for free, including architectural and structural engineer’s drawings. The planning application had several hurdles to overcome before work could start in earnest in 2003. Work was finally completed in time for the official opening in September 2004. In 2003 and 2004 the Society campaigned vigorously for amendments to the Civil Registration Bill as it passed through the Houses of the Oireachtas and it was very pleased to support the positions advocated by others, including the Association of Professional Genealogists in Ireland (APGI) and CIGO. In October 2005 the Society celebrated its 15th anniversary with the inauguration of its second President, Tony McCarthy, MA, FGSI from Cork who was to hold the position for the next four years. Back in 2000 the Society set out its proposals for legislative reform of the delivery of Irish heraldic services, this was followed in 2002 by its ‘Heads of a Bill’ and finally by the Genealogy and Heraldry Bill, 2006. The publication of the Genealogy and Heraldry Bill, 2006, in May 2006 was greeted with utter dismay and hostility in some circles close to the ‘office’ of the Chief Herald of Ireland, others, which included many parliamentarians, understood that the Irish heraldic system had no proper legal status since 1943 and that only a legislative remedy to this embarrassing situ ation. Indeed, it had been clear for some time that the College of Arms in London had serious doubts about the status of Irish grants, a point denied by the Chief Herald of Ireland at the time. Tony McCarthy, editor of ‘Irish Roots Magazine’ put the objectives of the Society’s Bill very succinctly in his editorial in Issue No. 58 – Second Quarter – 2006 – see here. The full text of the Genealogy & Heraldry Bill, 2006, can be accessed here. One proposal contained in the Bill urged the use of heraldry to award meritorious citizens and an OpEd piece on this issue was published in ‘The Irish Times’ on May 22nd 2006. ‘The Sunday Times’ – October 29th 2006 – ‘Irish coats of arms ‘have no legal basis’ by John Burns. ‘Daily Mail’ – October 30th 2006 – ‘Garter King questions legal basis of Irish chief herald – Family coats of arms may be worthless’ by Niamh Herbert. 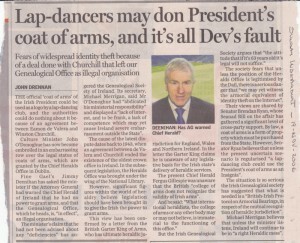 ‘Sunday Independent’ – November 19th 2006 ‘Lap-dancers may don President’s coat of arms, and it’s all Dev’s fault’ by John Drennan. This Bill represented a very significant milestone in the development of genealogical services in Ireland and indeed, following a two hour debate in December 2006 in Seanad Éireann, it was agreed to withdraw the Bill at the request of the Minister John O’Donoghue, TD, who promised to have the positions outlined in the Bill examined by the Board of the National Library of Ireland and especially, by its Chairman, Gerard Danaher, SC. Following the withdrawal of the Bill, the Society published authoritative articles on the current legal status and source of heraldic authority of the ‘office’ of the Chief Herald of Ireland by Prof. Noel Cox, which seriously undermined the ‘official’ view and supported the Society’s position as advocated in the Bill. With such serious doubts now surrounding the legal status Irish heraldic services, the Board of the National Library suspended all of its heraldic services early in 2007. For a list of Prof. Cox’s articles see the Index to the Journal on the top of the Home Page. The main article also appeared in the Dublin University Law Journal and on-line here. ‘Irish Independent’ – October 15th 2007 – ‘Coat of arms awards suspended after legal challenge’ by Michael Brennan, Political Correspondent. ‘Sunday Independent’ – October 21st 2007 ‘Red Hat’ for new cardinal could mean red faces for Government’ by John Drennan. 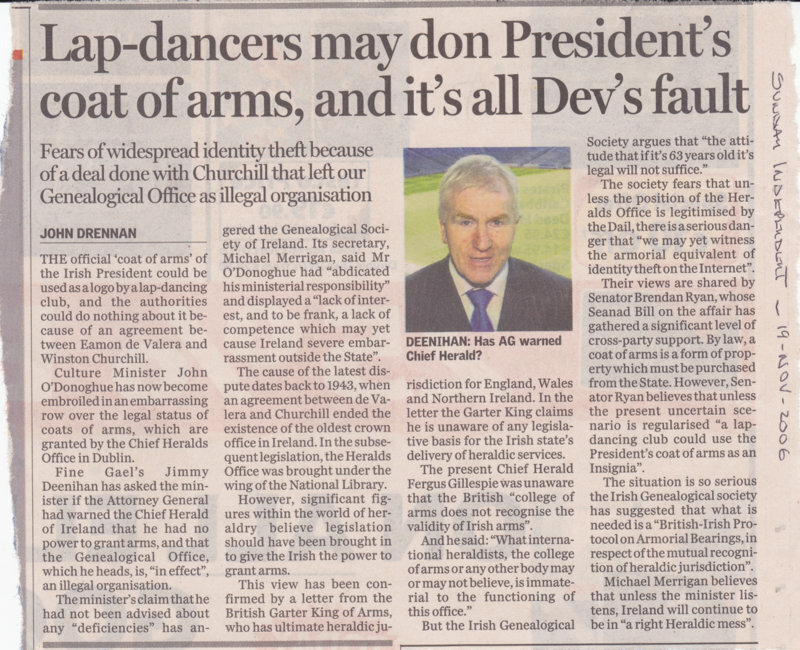 ‘Irish Mail on Sunday’ – October 21st 2007 ‘It’s genealogical meltdown… because Dev wouldn’t seek royal warrant – Arm-ageddon!’ by Nicola Byrne. ‘The Irish Times’ – October 25th ‘New Heraldry law needed urgently, society claims’ by John Downes. ‘The Phoenix’ – many articles throughout 2006 and 2007. Parliamentary Questions were tabled in Dáil Éireann and Seanad Éireann throughout the year urging the government to either bring forward amending legislation to remedy the situation or to make a statement on the matter. Finally on October 25th 2007 the Minister, Séamus Brennan, TD, admitted to Dáil Éireann that the State probably had no power to grant Arms from April 1943 until May 2005 when the provisions of the 1997 Act were finally implemented. This fully vindicated the Society’s long-held position on Irish heraldry. For details of the Parliamentary Question concerned see here. In addition to this Bill, the Society played a leading and independent role in campaigns on several legislative proposals throughout the decade, including the introduction of the National Cultural Institutions (Amendment) Bill, 2008. This Bill, which was sponsored by Senator Alex White, sought to deal with the immediate and pressing issues of the legal status of the Grants of Arms by the Chief Heralds of Ireland from April 1943 until May 2005. This position is still unresolved. The full text of the National Cultural Institutions (Amendment) Bill, 2008, can be accessed here. 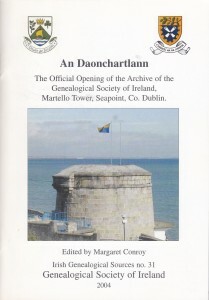 Also in 2006, the Society firmed up on its 1994 proposal with one for the establishment of an ‘Irish Institute of Genealogical & Heraldic Sciences’ with the presentation of a detailed proposal to the Dún Laoghaire Rathdown County Council for its consideration in respect of the acquisition of a suitable premises. Although a suitable premises was not identified at the time, the Society continued to advocate the establishment of such a facility. In March 2011, a new opportunity opened up with the proposed redevelopment of the facilities at Dún Laoghaire Harbour. The Society presented its proposal for the establishment of an ‘Irish Institute of Genealogical & Heraldic Sciences incorporating the Centre for Diaspora & Migration Studies’ to the Board of Dún Laoghaire Harbour Company. The Society was delighted that significant aspects of its proposal were included in the Harbour Company’s strategic plan. As the first genealogical organisation to campaign for the release of the 1926 census, this campaign was intensified in 2007 with the production of legislative proposals for the amending of the Statistics Act, 1993 to give a ‘special heritage status’ to this census. The headline in the June 2008 issue of ‘Ireland’s Genealogical Gazette’ [published June 9th 2008] read ‘Special Heritage Status for the 1926 Census Returns?’ proposing that the Statistics Act, 1993 be amended accordingly. In mid June 2008, the Fianna Fáil Senator Labhrás Ó Murchú agreed to sponsor a Bill drafted by the Society to have the 1926 census released, however, other pressing issues on the economic front delayed the introduction of the Bill – see below. On June 26th 2008, CIGO decided to enter the campaign publicly with an On-Line Petition to An Taoiseach to “use the powers vested in his office under section 33 (3) of the Statistics Act 1993 to release the complete returns for the 1926 census”. Unfortunately, the Board of the Society was unable to recommend the CIGO Petition to its members as it was based on a fundamentally flawed and erroneous reading of Section 33 (3) of the 1993 Act as An Taoiseach had no such powers. Therefore, once again, the Society reiterated its legally sound position that only legislative change could facilitate the release of the 1926 Census. With the deepening economic crisis hitting the country in 2008, the Minister Martin Cullen announced his plans to amalgamate the National Library, National Archives and the Irish Manuscripts Commission. Though this proposal lay dormant over the following year, concern was mounting amongst genealogists and other users of these repositories about this ‘back of envelope’ proposal. In April 2010, Dr. Peter Crooks of Trinity College Dublin organised a public meeting to address this important issue. Many speakers sought total rejection of this proposal and indeed, far from considering the economic realities in the country, openly advocated measures that would have needed a huge injection of capital by the government in a deepening recession. At this very well attended meeting, the Society suggested a workable solution of ‘legislative amalgamation’ whilst maintaining the separate institutions. The Society’s suggestion did not receive much support at the meeting in Trinity College, however, others agreed that such a solution offered the opportunity to up-date both the National Archives Act, 1986 and the National Cultural Institutions Act, 1997, through the introduction of new legislation required for any amalgamation. Although, the Minister, Mary Hanafin, TD, accepted the Society’s proposal in June 2010, the concept of ‘legislative amalgamation’ without requiring a ‘physical amalgamation’ was not readily understood nor appreciated by many genealogists. 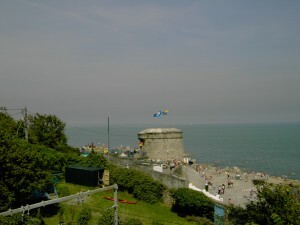 In 2008 the Society moved its growing Archive to a temporary premises in the centre of Dún Laoghaire as a more suitable maritime heritage use was being sought by Dún Laoghaire Rathdown County Council for the Martello Tower at Seapoint. The move to its current location at the Carlisle Pier at Dún Laoghaire Harbour in 2010 provided an excellent location for the provision of its services to members and to the general public. 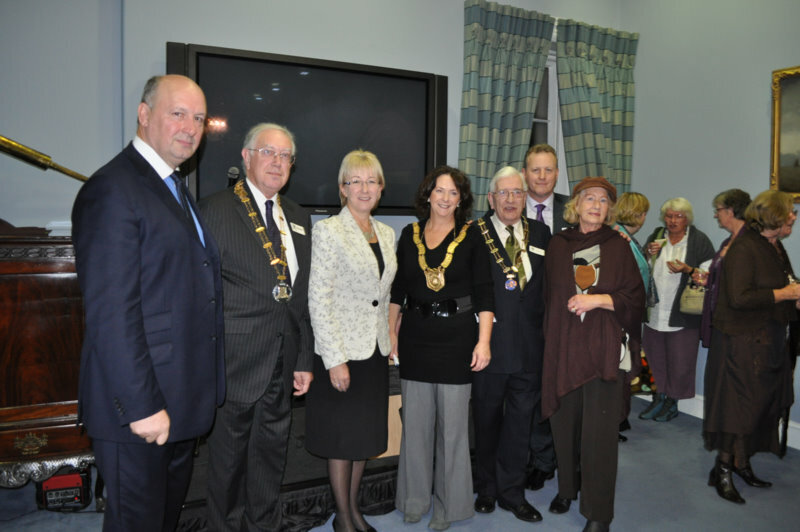 On Monday 8th November 2010 the Minister for Tourism, Culture & Sport, Ms. Mary Hanafin, TD, officially opened the new Headquarters and Archive of the Genealogical Society of Ireland at a ceremony held at the Harbour Lodge, Dún Laoghaire, Co. Dublin. The ceremony also included a cel ebration of the 20th anniversary of the foundation of the Society in 1990. Members and friends of the Society were joined by the Cathaoirleach of Dún Laoghaire-Rathdown County Council, Cllr. Lettie McCarthy; Mr. Seán Barrett, TD; Ms. Fiona Ross, Director of the National Library of Ireland; Mr. Seán Costello, Chairperson and Board of Directors of Dún Laoghaire Harbour Company; County Councillors and the President, Vice-Presidents and Board of the Society. This was a very special day for the Society as it celebrated two important milestones in the history and development of Ireland’s most active genealogical organisation. Ever since the foundation of the Society in October 1990 one of its main objectives was the establishment of a genealogical archive in Dún Laoghaire for items collected or donated by the Members and friends of the Society. A number of premises held the archival collections over the years, including the Martello Tower at Seapoint. Pádraic Ingoldsby, Cathaoirleach of the Society explained how the Society acquired the new premises “last year, thanks to Gerry Dunne, Chief Executive of the Harbour Company and, of course, through the good offices of Cllr. 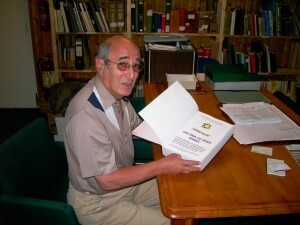 Victor Boyhan, the Harbour Company decided to offer of the premises at the Carlisle Pier in May 2010 to the Society. Fully refurbished the Society began its operations at the new premises in July 2010. It’s a superb location with ease of access and ample parking right in the heart of what could become the ‘heritage precinct’ of the Town and Harbour of Dún Laoghaire”. The Society’s Cathaoirleach, Pádraic Ingoldsby, noted that the Carlisle Pier in Dún Laoghaire was dubbed the ‘Pier of Tears’ in recognition of the possibly millions of emigrants that left our shores from this pier since 1859. He concluded by sincerely thanking and commending the Harbour Company for its decision to enhance the heritage potential of this area by allocating the premises to the Society. He then invited the Minister to officially open the Society’s new archive which is called ‘An Daonchartlann’ (Irish: People’s Archive). The Minister also presented a Special 20th Anniversary Award of a Fellowship of the Genealogical Society of Ireland to Mr. John Grenham in recognition of his outstanding contribution to genealogical research. Finally, Mr. Seán Costello, Chairperson of the Dún Laoghaire Harbour Company, thanked the Genealogical Society for co-hosting the event and wished the GSI Archives every success at the Carlisle Pier, Dún Laoghaire Harbour. This was certainly a great day for Irish genealogy – we have a public office for family history enquiries and, of course, a rather unique archive for research purposes. In 2010, Senator Labhrás Ó Murchú (Fianna Fáil) published the Society’s Statistics (Heritage Amendment) Bill, 2010, which sought to amend the Statistics Act, 1993 to allow for the designation of a special heritage status to be applied to the 1926 Census and thus permitting its early release to the public. 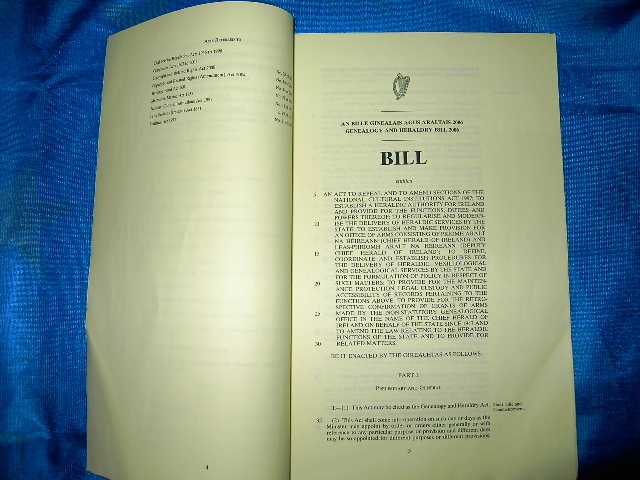 Following the General Election in 2011, Senator Ó Murchú restored this Bill to the Order Paper of Seanad Éireann as the Statistics (Heritage Amendment) Bill, 2011. The full text of the Statistics (Heritage Amendment) Bill, 2011, can be accessed here. In the run up to the General Election in 2011, the Society’s enviable and highly respected record of campaigning on various legislative matters concerning genealogy, heraldry and general heritage matters was further endorsed by the inclusion of the following points in the Programme for Government. We will promote genealogical tourism by updating the National Cultural Institutions Act in relation to the Genealogical office to put it on a proper statutory footing, modernise its operations and to enable publication of the 1926 census to stimulate genealogy tourism. We will also explore philanthropic opportunities for the development of a national archives and genealogy quarter, providing easy access to archives and tapping into an area of cultural tourism which is of huge interest to the vast Irish Diaspora. The full text of the Programme for Government can be accessed here. In February 2011 the Society decided to support the very important initiative taken by students at the University of Sarajevo in Bosnia and Herzegovina to restock the university’s library following the loss of its entire collection of books in the fire that destroyed the National and University Library in Sarajevo in August 1992. Given Ireland’s own experience of the destruction of our own Public Records Office in June 1922 at the start of our Civil War, we naturally empathise and wish to support our fellow Europeans in Bosnia as they lost over two million volumes, many priceless and rare manuscripts, in the destruction of the Vijecnica building in Sarajevo following the shelling by Bosnian Serbs during the Bosnian Civil War. A detailed draft programme of action was drawn up by the Bosnian students and the Society and it is being considered at European level following support received from MEPs and, of course, from our own parliamentarians here. The success in having the release of the 1926 census included in the Programme for Government was greatly overshadowed by the unnecessary and unwise suggestion by CIGO that the census should be released with the redaction of all information on persons born within the past hundred years. This ill-conceived proposal was met with absolute incredulity by our Members and indeed, according to some sources the ‘redaction proposal’ caused consternation amongst officials and almost derailed the whole campaign. Some former supporters of the ‘redaction proposal’ publicly admit that it was a ‘red herring’ and damaging to the campaign. Reports that the Minister supported this ‘redaction proposal’ are unfounded, however, until the Minister’s own amendments to the Statistics Act, 1993 are published we will not know if such unnecessary and costly impediments to full access to the 1926 have been fully abandoned. In September 2011, the new Minister for Arts, Heritage and the Gaeltacht, Jimmy Deenihan, TD, organised a day-long seminar in the National Library of Ireland, at which, many organisations and individuals, including this Society, gave presentations. The Society’s presentation was firmly based on the ‘Principle of Public Ownership and Right of Access’ to heritage and, upon such, we argued for a coordinated national policy and development framework for genealogical services in Ireland. The Society took the opportunity, once again, to reiterate its position on the 1926 census and on the services provided by the Heritage Centres throughout the country. To view the slideshow of the Society’s presentation to the NLI seminar click here. The latest legislative campaign undertaken by the Society concerns the restoration of the Privacy Bill to the Order Paper of Seanad Éireann – for further information see the May 2012 issue of ‘Ireland’s Genealogical Gazette’ here. All through the years, the Society has encouraged the tabling of Parliamentary Questions in Dáil Éireann; raising matters on the Order of Business in Seanad Éireann; advocating amendments to Bills in both Houses; made numerous submissions to State agencies, government departments and local government; formulated and published detailed proposals on many issues and shall continue to do so in the interests of its members and genealogy and heraldry in general. It is impossible to recount the many, many issues upon which this Society has campaigned since its foundation in 1990 and therefore, this brief account is intended as an information piece for our Members and an aide to those researching heritage matters in Ireland. For the sake of brevity many issues have not been covered here, however, information on these areas may be gleaned from the Indexes to either the Journal or the Gazette provided on the top of the Home Page.